What are the basic components of CHP and micro CHP technologies? There are three basic elements to most combined heat and power technologies. The first is the ‘Prime mover’ which is effectively the ‘engine’ that creates the mechanical motive power. The second is the electrical generator (if it is applicable to the individual device), and the third is the heat recovery unit(s). It is the latter 3 items in the above list that apply to mCHP (and can be applied to small scale residential or commercial properties), rather than custom CHP technologies (which are commonly associated with industry and commercially orientated heat and power generation). We will however, address them all in some part over the next few pages. Grid-controlled generators use control equipment to monitor the status of the grid. If the grid loses power they will shut down so they are not suitable for stand-by (backup) power generation. The application of these generators below the 100k output range pose a significant cost increase, so self-controlled generators are usually used. Self-controlled generators are used primarily for backup purposes or in areas where there is no access to grid supplied power. They operate in what is called ‘island mode’ when the grid fails, as this prevents electricity being passed back through the grid posing a risk to any workmen who could be fixing it. For steam turbine systems, this heat is used directly, but the pressure is usually reduced before it is used. For gas turbine systems, the heat is recovered in a steam generator, for which there are 2 main varieties: HRSG and fired HRSG, the latter using additional fuel burned within it to increase productivity. For mCHP and combustion engines systems, the heat is transferred to the water for heating through simple heat plate exchangers. What is microCHP fuel cell technology? 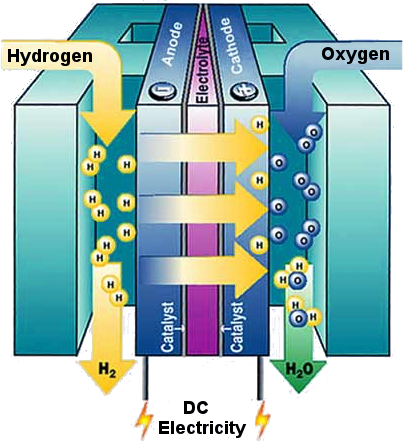 A fuel cell is an electrochemical cell that directly generates electricity and heat from hydrogen rich fuels. This process is often accelerated by a catalyst such as a transition metal or an acid solution. Fuel cells operating at high temperatures (>600°C) do not require catalysts. The technology is similar to a battery in that it creates a DC charge from a chemical reaction, however fuel cells cannot store electrical energy they just produce it, as long as there is a continuous supply of fuel and air. These systems are more expensive than their Stirling engine counterparts, but offer higher electrical efficiencies of around 55%, benefitting by operating through a clean electrochemical reaction rather than through combustion. As with the other prime movers, waste heat is produced, which can then be recovered and used for heating, further increasing the overall efficiency of their process. 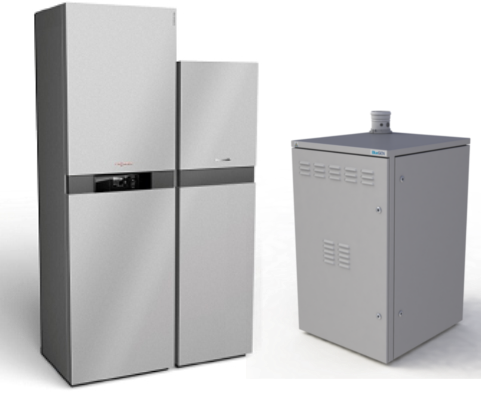 They offer significantly higher electrical efficiencies (30-45%) and good transient performance, which promises the potential to deliver the greatest benefits for residential energy production and if fuelled on pure hydrogen they produce no CO2 at all. Fuel cells produce electricity though a silent electrochemical reaction, generating it considerably more efficiently than the other methods on the market currently. What is microCHP Stirling engine technology? 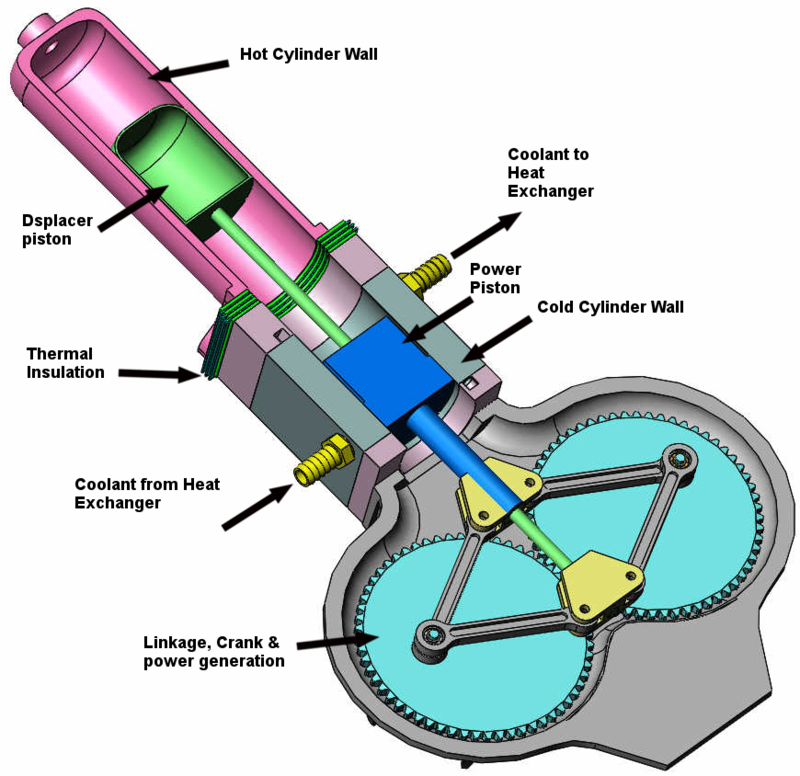 A Stirling engine operates via external combustion; this means that all its heat flows in and out through the engine wall. The engine encloses a fixed quantity of permanently gaseous fluid such as helium or air. This operates by expanding and contracting the hot and cold gas, driving the pistons creating a mechanical cycle. There are 2 pistons involved: a 'Displacer piston' and a 'Working piston'. Performance and reliability are generally higher than internal combustion engines, but the domestic systems currently available have an extremely low efficiency of between 6-8%, so there is a chance that they could actually increase CO2 emissions in the US if replacing a high efficiency condensing boiler. These engines use compressed, high velocity air to drive the turbine and in-turn the generator. This air is brought up to pressure and temperature by burning fuel (usually natural gas), where it expands down to the exhaust pressure driving the turbine. 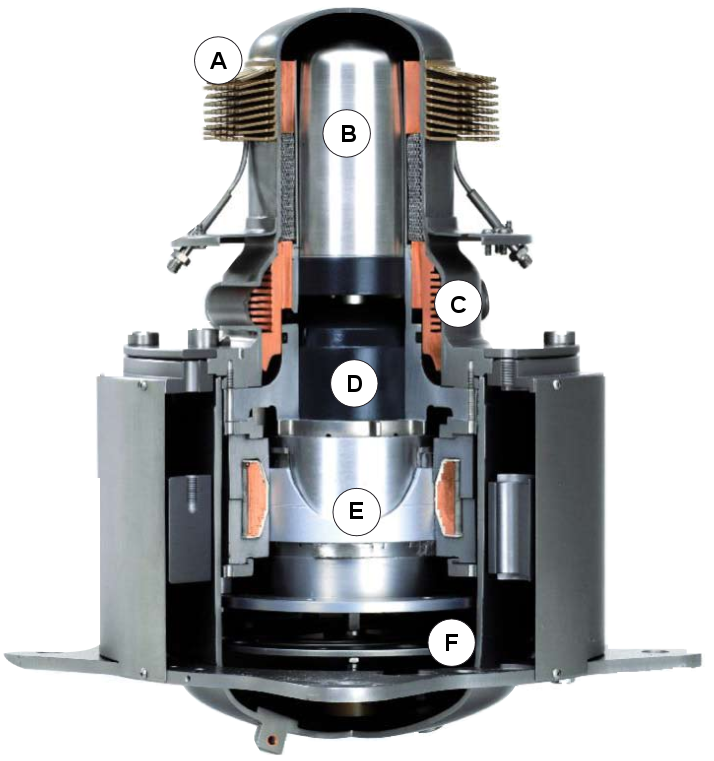 It is by driving this shaft coupled to the generator and the compressor, that produces both the compression method and mechanical rotation to drive the altenator for the electricity. Once the hot air has passed through the turbine it is utilised by the heat exchanger. These systems harness the heat from the exhaust from the above Gas Turbine engine and create steam with it. This steam then is used to power an additional steam turbine increasing efficiencies to 55% (average of about 52%). These systems are custom-built and are used in large-scale power generation. These use high-pressure steam in a constant flow which is generated in a boiler to drive the turbine. Electrical efficiency is maximised when the steam is condensed and pumped back to the boiler as hot water just below boiling point. The thermodynamic cycle is called the Rankine cycle. The industrial scale fully-condensing steam turbines in power plants (both nuclear and fossil fuel) have average electrical efficiencies of about 36-38%. But in CHP applications, (where the steam extraction reduces their electrical output), they have typical electrical efficiencies of 10.7-20%. However it must be noted that their overall efficiency ranges from 77.6-82.5%. As low-grade hot water (about 30ºC) recovered from the secondary cooling circuit in the condenser with no consequent loss of power. 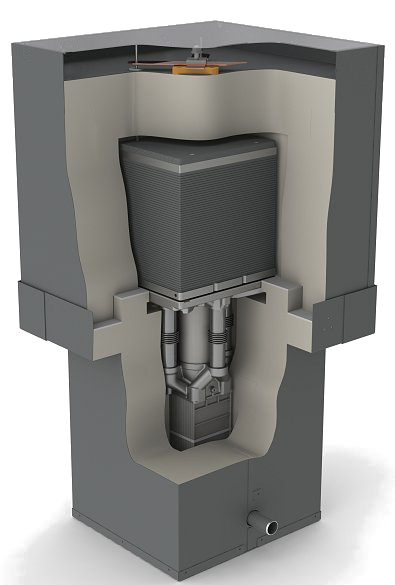 This is the most efficient option but is not common as such low grade heat is only of use in a few applications such as liquefied natural gas vaporisation. 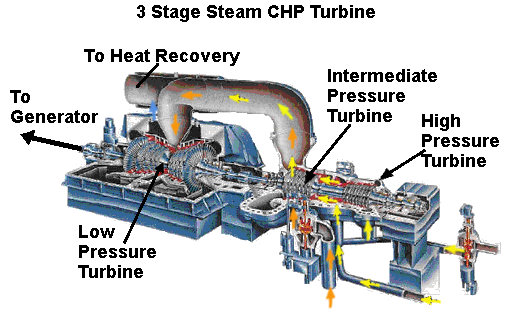 As medium-pressure steam between turbine stages (‘pass-out’). This reduces power generation (electrical efficiency). As low-pressure steam slightly above atmospheric pressure exiting the final stage of the turbine (‘back pressure’). Heat can then be used for process or space heating. Such turbines are particularly appropriate for CHP when steam is needed, or where the fuel available cannot be burned directly in the prime mover. They are typically suited to large-scale applications or where the amount of heat required is much greater than the amount of power. An ORG CHP system operates in much the same principal as a steam turbine however it uses a lower (or higher) boiling point fluid to function. The technology operates by using low-grade heat to generate extra power. These can be driven by waste heat from conventional CHP or by normal boilers. Technology is not classified as CHP if heat from a boiler-driven ORC is diverted for use. This phrase only applies if the ORC is driven by a conventional CHP and some heat is recovered before entering the ORC. This counts as CHP. Recovering heat from the ORC cycle itself will not be practical in many cases as the temperature of the condenser is around 20°C, which is too low for most applications. Recovering heat between turbine stages would reduce an already low efficiency process. Future ORC technologies are rumoured to use a working fluid with an increased boiling point such as oil, so heat recovered through the ORC process is more useful.